HRH Princess Beatrix of the Netherlands is a truly beloved figure. Recently we spotted her proudly wearing her very own floating-diamonds "Stars" ring by Royal Asscher ! 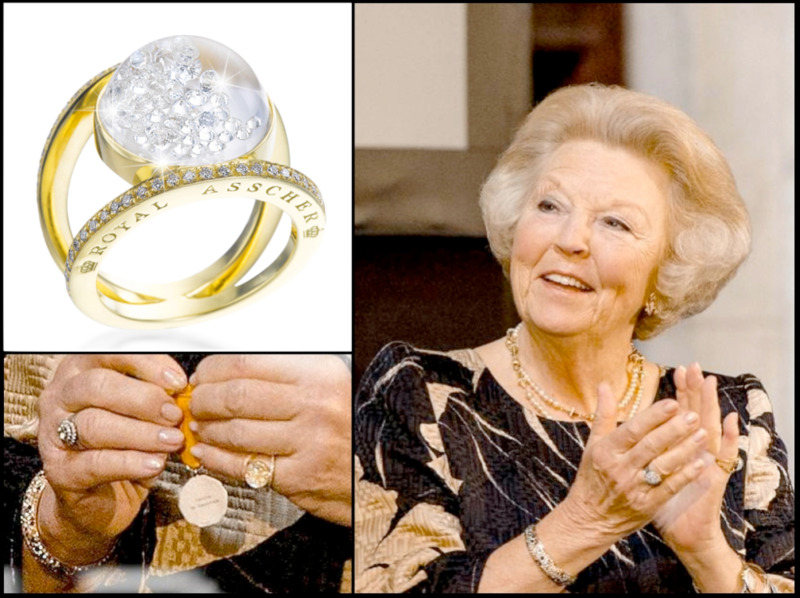 HRH Princess Beatrix spotted wearing her very own floating-diamonds "Stars" ring by Royal Asscher ! At the Silver Carnation Culture Awards at The Royal Palace on June 18, 2013 in Amsterdam, Netherlands. On the occasion she awarded three Silver Carnations in the Royal Palace in Amsterdam. This is the award that Prince Bernhard established in 1950 as a tribute to people who do voluntarily work for culture or nature. Beatrix is the former queen regnant of the Kingdom of the Netherlands, having reigned from 1980 to 2013. Following her abdication on 30 April 2013, she is once again called Princess Beatrix. Royal Asscher "Stars" floating-diamonds ring worn by Princess Beatrix.